PONANT has taken delivery of Le Bougainville, the third ship in the PONANT EXPLORERS series and the eighth vessel in its fleet. Le Bougainville left Søvik, Norway on April 8 and will reach Malaga, Spain on April 15 for the start of her maiden cruise. The official inauguration will take place on June 4. As with its sisterships, Le Bougainville will feature just 92 staterooms and suites, all with a balcony or private terrace, and a refined design with taut, sleek lines and cutting-edge technologies with respect to the environment. It is also fitted with the world’s first “Blue Eye” lounge. This multi-sensorial underwater salon allows guests to discover and experience the underwater world via two portholes in the form of a cetaceous eye looking out on to the sea bed. The lounge also features non-intrusive underwater lighting, hydrophones integrated into the keel to transmit the natural symphony of the deep water, and body-listening sofas that offer a unique sensorial listening experience by corporal resonance. 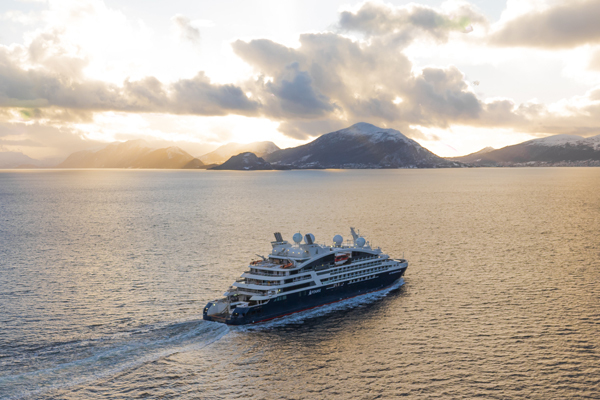 Sail on over to www.ponant.com for more.